Twenty NFL teams missed the playoffs. Here are the biggest offseason tasks for each of them. 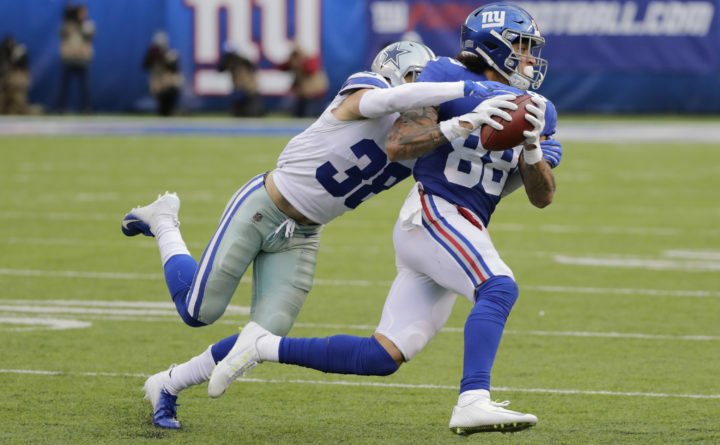 Dallas Cowboys' Jeff Heath, left, tries to tackle New York Giants' Evan Engram on Sunday during the second half of an NFL football game in East Rutherford, New Jersey. For a dozen NFL teams, the playoffs are about to get underway. For everyone else, the offseason has arrived. Here’s a team-by-team look at the most significant roster-retooling task for each of the league’s 20 playoff non-participants. The teams are listed in the order in which they’ll pick in the NFL draft. — Arizona Cardinals (Record: 3-13): The Cardinals are on the clock for the top overall selection as they search for a replacement for Steve Wilks, the coach they fired after only one season. They have their would-be franchise quarterback in Josh Rosen, so they undoubtedly would like to trade down. Unfortunately for them, there’s probably not a quarterback in the draft to prompt overwhelming trade offers. — San Francisco 49ers (4-12): The season-ending knee injury to quarterback Jimmy Garoppolo kept the Niners from building on their strong finish to 2017. As a result, General Manager John Lynch and Coach Kyle Shanahan will enter Year 3 of their six-year contracts with little progress made toward respectability. Ensuring that Garoppolo’s return goes smoothly, without significant setbacks, is by far the main priority entering next season. — New York Jets (4-12): The numbers weren’t great for quarterback Sam Darnold in his rookie season, but he showed enough promise to justify the No. 3 overall choice in last year’s draft. The keys now are to bring in an offensive-minded head coach to oversee Darnold’s development and to add some talent around him, perhaps by making a bid to acquire running back Le’Veon Bell. — Oakland Raiders (4-12): Now that Mike Mayock is in place as general manager alongside Coach Jon Gruden, it’s all about how to use that trio of first-round draft picks. The trades of Khalil Mack and Amari Cooper mean that the Raiders must get a great pass rusher and standout wide receiver just to break even. Having a place to play next season also would be nice. — Tampa Bay Buccaneers (5-11): The Buccaneers are making a head coaching change, having fired Dirk Koetter, but say they are committed to sticking with Jameis Winston at quarterback. He is to be paid $20.922 million next season in the fifth-year option of his original rookie deal exercised by the team. How will head coaching candidates react to being told that Winston will be their quarterback, and will the Buccaneers eventually make a more lasting commitment to Winston with a long-term contract? — New York Giants (5-11): So much for the decision to pass on a quarterback with the second overall choice in last year’s draft to take running back Saquon Barkley. Nothing against Barkley, who’s terrific. But this is not the draft to be looking for a future franchise QB, and the Giants probably will have little choice but to enter another season with Eli Manning as the starter. They do need to add the best young quarterback they can find, however. — Jacksonville Jaguars (5-11): Owner Shad Khan opted against an organizational housecleaning even after the Jaguars went from reaching the AFC championship game to being one of the league’s biggest disappointments this season. The decision to stick with Blake Bortles going into the season backfired. It’s probably time for the Jaguars to stop hoping that Bortles will work out and go in a new direction at quarterback. — Detroit Lions (6-10): Matt Patricia, the Lions’ rookie head coach, inherited a team that went 9-7 under predecessor Jim Caldwell in 2017 and promptly went 6-10. Patricia’s defenders talk about the need to establish a new culture in Detroit. But what he has established is a six-win culture. The Lions had better hope that Patricia grows into the job. The offense must improve, beginning with Patricia’s choice of a new coordinator, and Golden Tate, who was traded midseason, must be replaced. — Buffalo Bills (6-10): Quarterback Josh Allen was an effective runner as a rookie but was even more unpolished as a passer than expected, with an ugly completion percentage of 52.8 and an unsightly passer rating of 67.9. The Bills’ offseason will be devoted to trying to mold Allen into a more accurate and reliable pocket passer while utilizing their improved salary cap situation to upgrade the offense around him, likely adding a No. 1 wide receiver and deciding whether to keep running back LeSean McCoy. — Denver Broncos (6-10): Front office football czar John Elway is looking for a new coach after firing Vance Joseph. Will Elway be back in the quarterback market as well? That’s an interesting call. Case Keenum threw too many interceptions and didn’t live up to expectations in his first season in Denver. But if he somehow could recapture his 2017 level of play while with the Vikings, he’d probably be better than anyone the Broncos could add this offseason. — Cincinnati Bengals (6-10): It will be a new era for the Bengals after they and their coach of 16 seasons, Marvin Lewis, parted ways in what the team called a mutual decision. Owner Mike Brown could opt for a more widespread organizational reset that also would include a change at quarterback. The structure of Andy Dalton’s contract, with no guaranteed money remaining, means that he could be traded without the Bengals incurring any so-called dead money on their 2019 salary cap. — Green Bay Packers (6-9-1): The Packers’ offseason is all about ensuring that whichever coach they hire to replace the fired Mike McCarthy is on the same page with Aaron Rodgers. It seemed, especially in McCarthy’s final season, that there was a disconnect between coach and quarterback. That simply cannot happen with Green Bay’s next coach. The Packers can’t waste any more of Rodgers’s prime, and they need him to get back to being a player who negates the deficiencies elsewhere on the roster. — Miami Dolphins (7-9): Coach Adam Gase failed to make things work with Ryan Tannehill. Now Gase has been fired and the Dolphins’ new regime, with General Manager Chris Grier being given additional front office authority, must decide whether to stay the course with Tannehill or start over at quarterback. — Atlanta Falcons (7-9): The defense and running game must be repaired. Matt Ryan and the passing game were fine. But the Falcons ranked 28th in the league in total defense and 27th in rushing offense. Even in a pass-happy league, the Falcons need to be better balanced to get back to having success. — Washington Redskins (7-9): The quarterback situation is a quandary, with the uncertainty about Alex Smith’s return and the salary cap constraints created by his big contract. The Redskins probably must prepare to play without Smith by getting a QB to go with Colt McCoy and, possibly, Josh Johnson. Adding a No. 1 wide receiver certainly wouldn’t hurt. — Carolina Panthers (7-9): The main issue is getting QB Cam Newton healthy. Newton was on the fringes of league MVP conversation early in the season but his ailing shoulder contributed to the Panthers’ downward spiral in the season’s second half. Newton sat out the final two games. The Panthers must make sure his shoulder is sound, and they probably have to add a better option as their backup quarterback, just in case. — Cleveland Browns (7-8-1): Things are looking up for the Browns. That hasn’t been said very often over the years. Baker Mayfield is the real deal and looks like an honest-to-goodness franchise QB. The pieces are in place for a winner. General Manager John Dorsey merely needs to do some roster tweaking and make sure he hires a coach who will oversee Mayfield’s development deftly. — Minnesota Vikings (8-7-1): Things didn’t go quite as expected in the first season of Kirk Cousins’ fully guaranteed three-year, $84 million contract. But there’s no turning back now and there are no refunds on that $84 million. So the Vikings must regroup and try to upgrade the team around their quarterback, beginning with his offensive line. — Tennessee Titans (9-7): So is Marcus Mariota a true franchise quarterback or not? Four years into his NFL career, it’s difficult to know. He has totaled 24 touchdown passes and 23 interceptions over the past two seasons, and he’s had difficulty avoiding injuries. No one is saying that it’s time for the Titans to give up on Mariota. But his recovery from nerve injuries and the signals that the team sends about his future contract situation will be the biggest issues of the Titans’ offseason. — Pittsburgh Steelers (9-6-1): Remember when quarterback Ben Roethlisberger, running back Le’Veon Bell and wide receiver Antonio Brown were going to be the centerpieces of a Super Bowl team? Now the Steelers await Bell’s pending departure in free agency after he sat out the entire season in a contract staredown with the team and they must figure out what, if anything, to do with Brown, who reportedly asked to be traded after his dust-up with Roethlisberger.